I’m not a religious person. I don’t belong to a church. I don’t have any particular attachment to Easter – except for the pretty colors, warmer weather, and CADBURY MINI EGGS. Honestly, what does Cadbury add to these little bites of goodness that make them so addictive? The crunchy shell. The rich chocolate. Perfection. These cookies were delicious. Chewy in the middle. Crunchy on the outside. Filled with Cadbury Mini Egg bits and pieces. I wish it were easier to take photos of chocolate cookies without them looking dark and unappealing, but trust me: these cookies are divine. 2. Chop up the Cadbury Mini Eggs. Put them in a Ziplock bag and bang on them with a rolling pin until crumbled. 3. Cream together the butter, crisco, brown sugar and white sugar. Add in eggs one at at a time and the vanilla. 4. In a separate bowl whisk together the flour, soda, baking powder, salt, and cocoa powder. Add flour mixture to the butter mixture to combine and then mix in the candies. 5. Drop onto a cookie sheet and cook for about 8-10 minutes. Remove to a cooling rack and try not to stuff them in your face to quickly. 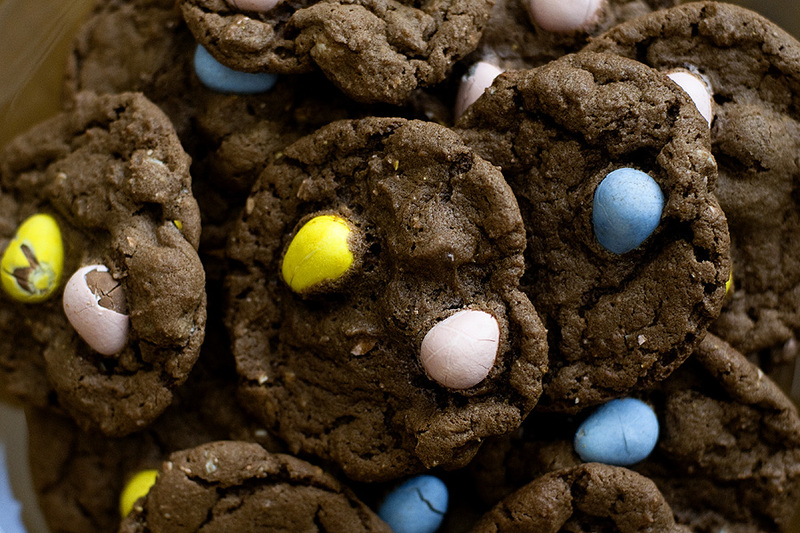 Note: Save some whole mini eggs to place on top of the cookies before baking – it makes them look prettier! I have given it much thought (seriously) and I have come to the conclusion that it is the matte texture of the shell (and the generous ratio of chocolate to candy) that makes them so flingin’ flangin’ good. But mostly the eggshell-y shell.